This spring, Aquarion implemented a water restriction in Westport. The town of Westport and our Green Task Force held 2 informational workshops. Aquarion sent out postcards to residents (and I assume businesses). The other day, I noticed this sign. I also noticed some Aquarion trucks driving around town, but that isn’t unusual. My guess is that this commercial property has an automatic sprinkler system. Aquarion wants the property owner (and anyone who drives by on the Post Road) to know that the system can’t run every day. But will the property owner notice? Or care? 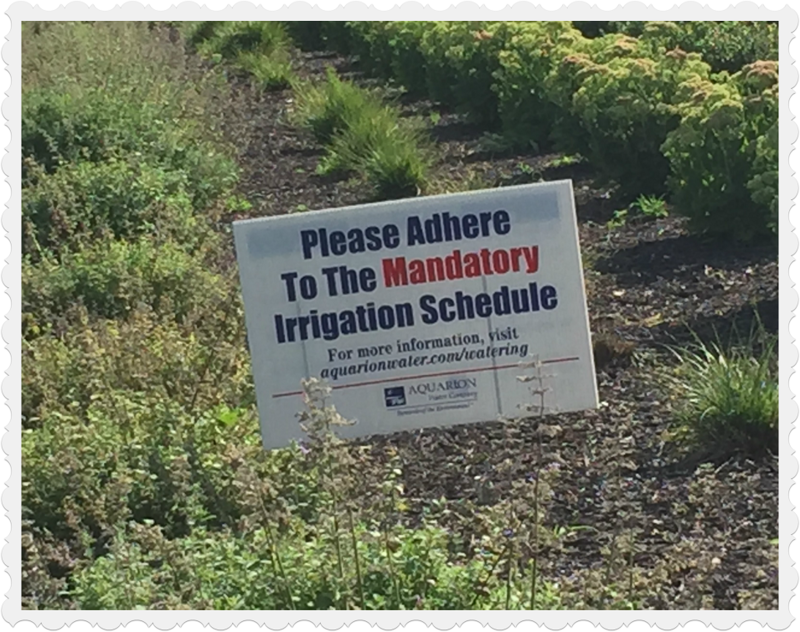 This entry was posted in Environment and tagged Aquarion, Westport water restrictions. Bookmark the permalink. ha ha… no need to conserve this year. Reservoirs are overflowing!!! No rational person has their irrigation system running EVERY DAY. They very shortly wouldn’t have any landscaping left to irrigate. Instead of indulging it’s goofy fetish about our irrigation systems maybe Aquarion could devote the time to figuring out how to replace water mains in Westport without creating chaos. Its 4 month Myrtle Ave. project has been like a country music song; everything that could have been broken, scorched, mangled, delayed or otherwise screwed up – was been. And its customers in harms way have been on the business end of that – EVERY DAY. Believe many should think what that is about!